This paper describes the development of the Individual Reporting Compliance Model (IRCM), an agent-based model for simulating tax reporting compliance in a community of 85,000 U.S. taxpayers. Design features include detailed tax return characteristics, taxpayer learning, social networks, and tax agency enforcement measures. The taxpayer's compliance reporting decision is modeled as a partially observable Markov decision process that takes into account taxpayers' heterogeneous risk profiles and non-stationary beliefs about the expected costs associated with alternative reporting strategies. In order to comply with legal requirements prohibiting the disclosure of taxpayer information, artificial taxpayers are created using data from the Statistics of Income (SOI) Public Use File (PUF). Misreported amounts for major income and offset items are imputed to tax returns are based on examination results from random taxpayer audits. A hypothetical case study illustrates how IRCM can be used to compare alternative taxpayer audit selection strategies. In tax year (TY) 2006, the U.S. Internal Revenue Service (IRS) estimates the gross tax gap – the true amount of tax due but not paid voluntarily and timely – was $450 billion, representing 16.9 percent of the total tax due from individuals and corporations. The loss of revenue associated with the tax gap is a burden that falls disproportionately on compliant taxpayers and contributes to the nation's budget deficit. Consequently, finding ways to reduce the tax gap is an ongoing concern for the IRS. Research on individuals' motives for complying with tax laws has flourished since the 1972 publication of Allingham and Sandmo's (1972) groundbreaking theoretical work on the subject. However, this vast body of knowledge has not been successfully integrated into computational tools that could help tax administrators improve taxpayer compliance. The lack of progress on applications development stems from researchers' inability to incorporate sufficient realism into theoretical models of taxpayer behavior (Alm 1999). The realization that analytical methods are often inadequate for modeling complex social phenomena has led to the growing interest in agent-based modeling (Axtell 2000; Janssen & Ostrom 2006; Alm et al. 2010). During the last decade a number of agent-based models (ABMs) of taxpayer compliance have appeared in the literature (Antuñes et al. 2007; Bloomquist 2004, 2006; Davis et al. 2003; Hokamp & Pickhardt 2010; Korobow et al. 2007; Mittone & Patelli 2000; Szabó et al. 2008; Zaklan et al. 2009; Andrei et al. 2014). Mainly exploratory in nature, these models lack the degree of realism required for applied use, such as a detailed representation of income reporting requirements and key institutional relationships linking taxpayers, tax preparers, employers and the tax agency. This paper introduces a model that addresses many of these operational deficiencies. This paper describes the design and implementation of the Individual Reporting Compliance Model (IRCM), an ABM that simulates the income tax reporting behavior of a community of 85,000 individual taxpayers. This paper's main contribution to the ABM literature is a model on a topic (tax compliance) having significant importance for national and sub-national governments worldwide and that incorporates a high degree of fidelity to the environment in which both taxpayers and tax agencies operate. For example, the IRCM (or the "model") includes many enforcement mechanisms used by tax agencies, such as audits and information reporting, as well as detailed information on the reporting compliance for major income and offset items. A point-and-click interface allows the user to easily explore the impact on taxpayer reporting compliance of alternative assumptions concerning tax agency enforcement and information reporting. In order to comply with IRS disclosure rules no taxpayer data is used. Instead, a dataset of artificial taxpayers is created by selecting cases (with replacement) from the Statistics of Income (SOI) Public Use File (PUF) (Weber 2004) that are close statistical matches for actual tax returns. The model is written in Java and uses Repast (North et al. 2007) software libraries for random number generation and chart production. Finally, the model design allows for new information about taxpayer behavior to be incorporated as such information becomes available. The outline of this paper is as follows. Section two gives an overview of the IRCM framework and describes agents and agent behaviors. Section three describes the steps involved in constructing the dataset of artificial taxpayers used by the model. Section four discusses model validation and calibration. Section five presents a hypothetical case study analyzed using IRCM. Section six concludes and highlights topics for further research. Figure 1 graphically displays the IRCM agent architecture. A single Region is composed of multiple non-overlapping zones. Each Zone represents the place of residence for a group of filers (e.g., a postal zip code zone). Each Zone also has a list of all tax preparers and employers located within its borders. A Preparer agent prepares tax returns for its clients. Employer agents represent firms having one or more employees. Form 1040 filers are represented by Filer agents. A tax return is an instance of the TaxReturn class. All tax returns are reviewed by a tax agency (an instance of the TaxAgency class) and are subject to a possible audit. The tax agency selects filers for audit using one of three user-specified audit strategies: random, fixed proportion, and constrained maximum yield (CMY). The CMY audit selection strategy uses a simple learning algorithm to incrementally improve overall yield per return audited. The interaction between filers and the tax agency is illustrated in Figure 2. The filer either uses a paid preparer or self-prepares. The tax agency reviews the return and determines if any discrepancies are present on items with third-party information reporting (e.g., Form W-2 for wage and salary income). If the return is audited the amount misreported is recorded. If not audited, the filer decides how much income to report in the next period for items with little or no third-party information reporting. If audited, the filer may reevaluate reporting on all major income and offset items. 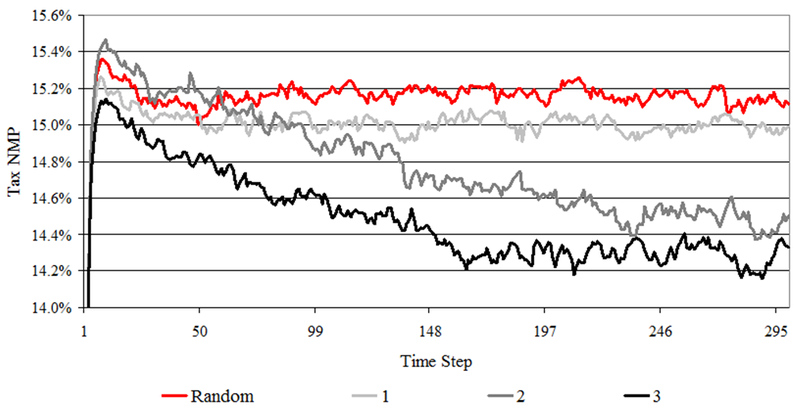 The steps followed in executing a simulation using IRCM are shown in Figure 3. The model reads tax return data for the population of artificial taxpayers and instantiates agents. During instantiation, IRCM estimates a true amount for the most important Form 1040 income and offset items which is defined as the reported amount plus imputed misreporting. Imputed amounts are based on audit results from the TY 2001 National Research Program (NRP) study. Details of the imputation methodology are described in Bloomquist (2012). Each time step represents one filing cycle (year). Tax calculations are performed twice for all taxpayers, once using reported amounts and again using estimated true amounts. The difference in calculated tax using true and reported amounts is the tax gap for each filer. By default, IRCM assumes the difference between the true and reported tax amounts is the amount identified by the tax auditor. An option is provided to account for underreporting not detected by examiners (see Bloomquist 2012). Tax audits are performed at the penultimate step in each time loop. During wrap up, the tax agency issues notices to taxpayers who are not audited but where computer checking of tax returns against information documents detects some underreporting. In addition, filers who stop filing, either because they leave the region or no longer have an obligation to file, are replaced by a new filer having identical income and network relationships as the "stop filer" being replaced, but with reporting behavior and memory reset to baseline levels (i.e., no memory of a prior audit experience or audits of reference group members, if that option is selected). The reporting behavior of filers who are not "stop filers" is also updated at each time step, as is the audit selection strategy of the tax agency. Finally, data collection occurs during the wrap-up phase. 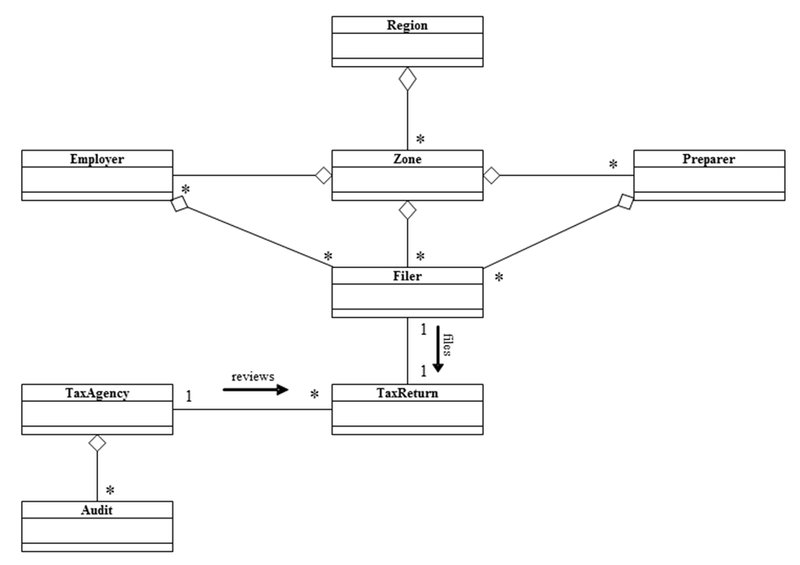 When the user-specified number of time steps has completed the model generates output in the form of tables and charts that can be reviewed and saved for further analysis. is the cost/reward (or expected cost/reward) experienced from transition to state s' from state s with transition probability Pa(s'|s). The quantity Pa(s'|s) is the probability that if action a is executed in state s, then state s' will result. For example, if a taxpayer decides to increase compliance following a tax audit, one can infer that the action is being taken in order to reduce the probability of being selected for an audit (and the associated costs) in future time periods. Since the observations in a POMDP represent probability distributions, rather than exact states of the system, the probability distributions are called belief states and are updated using Bayes Rule. The use of Bayes Rule implies that the probabilities represented by Pa(o|s) are not static but change as knowledge of the enforcement environment changes. In IRCM neither the belief states (O) nor the cost functions (C) of individual filers are modeled explicitly but are implied in the stochastically driven "choices" made by filers. This approach is taken since, at present, so little empirical data is available to indicate about how taxpayers perceive the tax enforcement environment or the specific causes that motivate changes in observed behavior. 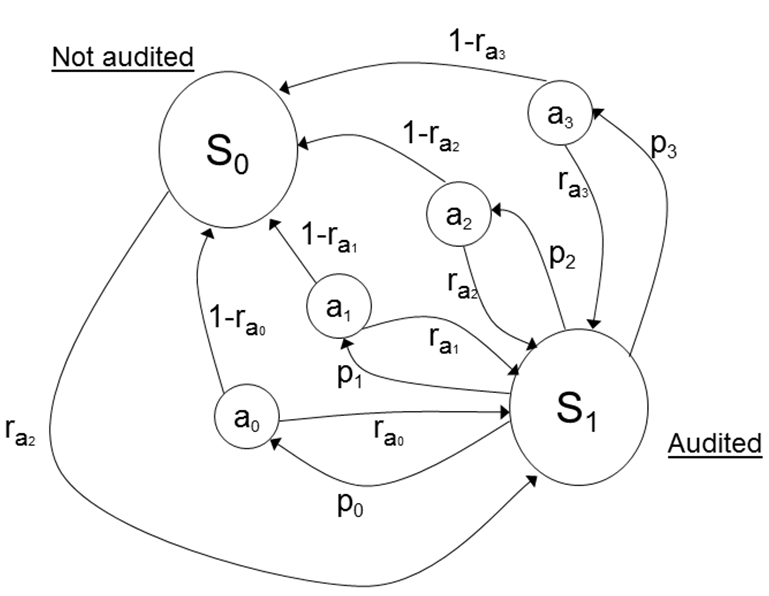 However, modeling filers' response to audits as a stochastic process is supported by observed behavior in tax compliance laboratory experiments (Alm 1999). Figure 4 graphically illustrates the POMDP portraying a filer's response to a tax audit. The two states are not audited (S0) and audited (S1). The filer's belief about the probability of audit is defined as rak = b(r|ak) which implies that the filer's perceived probability of being selected for a tax audit depends on his or her belief about how the baseline audit probability (r) changes with a change in reporting behavior (action) ak. In Figure 4 it is assumed a0 = no change in reporting compliance, a1 = an increase in reporting compliance, a2 = decrease in reporting compliance and a3 = perfect reporting compliance. If not audited in time t the filer may start or increase underreporting in time t+1 on income subject to little or no information reporting, assuming the filer has such income from one or more sources. If the filer is audited in time t, the decision to select action a0…a3 is determined in IRCM by a random draw and the user-specified probabilities p0…p3. Although IRCM models the filer's response as a stochastic process, actual filers are presumed to select an action ak based on their (heterogeneous and non-stationary) beliefs about the expected cost associated with that action. 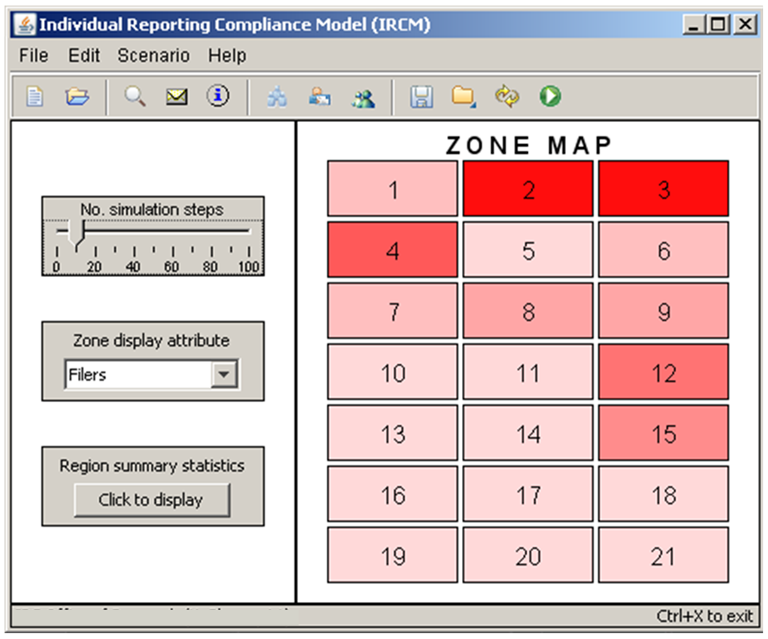 Figure 5 displays the IRCM's main screen where the user defines the baseline and alternative scenarios, launches simulations, and views output for the region and zones. Zones can be displayed with different characteristics including the number of filers, average reported income, and tax compliance rate. Tables summarizing key measures can be displayed for the entire region or for individual zones. From these tables the user can drill-down to the level of individual employers and tax preparers located within the selected area. This capability is useful for model verification and to investigate the spatial variation in filing and compliance behavior. The area selected as the test-bed region is a single county with 85,000 individual tax filers in TY 2001. The region was selected based on its overall similarity to the nation on key economic and demographic characteristics (e.g., age structure, industry structure, racial composition, per capita income, etc.) as well as number of filers, which is sufficiently small to be modeled on a personal computer. In order to preserve taxpayer anonymity yet allow for independent verification and validation, the model is implemented using a dataset of artificial taxpayers. The basic idea in creating a dataset of artificial taxpayers is to substitute cases from the 2001 Statistics of Income (SOI) Public Use File (PUF) for actual tax returns of individual filers in the study area. Although most fields in the PUF are derived from tax forms, SOI modifies the data in order to protect the identity of individuals. The statistical matching procedure used to create the database of artificial taxpayers is described in detail in Bloomquist (2012). A two-stage approach is used to validate and calibrate the IRCM. In stage 1 (validation) the model is executed using values from the PUF (the "SOI reporting regime" option) and output is compared to IRS estimates of reporting noncompliance published tax gap studies. The method of comparison follows the cumulative approach of Axtell and Epstein (1994). They propose a hierarchy of four levels at which an ABM can be validated. A model with Level 0 validity is considered to be a caricature of reality. At this level the model needs to show only that the system as a whole exhibits behavior that is consistent with the available data (e.g., the aggregate response of agents to changing environmental conditions is in the appropriate direction). At Level 1 the model is expected to be in qualitative agreement with empirical macro-structures. This is demonstrated by comparing the distributional characteristics of the actual population to the modeled population. To be valid at Level 2 the model must show quantitative agreement with empirical macro-structures. Finally, at Level 3 the model exhibits quantitative agreement with empirical micro-structures, as determined from cross-sectional and longitudinal analysis of the agent population. IRCM's on-board graphical and statistical routines are used to demonstrate model validity through Level 2 (Bloomquist 2012). Validation at Level 3 requires panel data on individuals' tax reporting behavior, which is a standard not yet available to researchers. In expression (4), is the calculated reported amount using the rule-based reporting regime in IRCM for income type i and is the calculated reported amount for income type i using the SOI reporting regime. A solution for expression (4) is found by inspection using multi-stage Monte Carlo simulation, the details of which are described in Bloomquist (2012). This section presents a simulation experiment that shows how the IRCM can be used to assess the impact on taxpayer compliance of alternative audit case selection strategies. For this experiment the IRCM is executed using the rule-based reporting regime option with default values for the six parameters. In addition, it is assumed that if taxpayer j is audited then each of j's neighbors or co-workers have a 25 percent chance of increasing their compliance, a 25 percent chance of decreasing their compliance and a 50 percent chance of no change. Both coworker and neighbor reference groups are assumed to have a fixed size of five members. Default values were used for all other model options. Table 1 displays the output from IRCM for four alternative audit allocation strategies. The strategy labeled "Random" is the baseline for comparing all other strategies and represents the direct effect (Audit Results), total misreported tax, and no change rate when individuals are randomly selected for a tax audit. Strategy 1 represents a slight improvement over the Random strategy by assigning more audits to groups of taxpayers with the highest average expected yield while not auditing more than one percent of taxpayers in a given audit class. Strategy 2 is similar to Strategy 1 but has no fixed constraint on the maximum coverage rate for audit classes. This strategy has the largest direct tax change ($2,739,000) and the lowest no change rate. However, this strategy also has the lowest deterrence multiplier (1.5), which indicates that indirect effects (i.e., a change in compliance behavior of audited taxpayers in subsequent time periods and "contagion" effects via social networks) account for a relatively small share of the total compliance impact. Finally, Strategy 3 allows up to a 10 percent coverage rate within an audit class but also requires a minimum of five audits for each audit class to ensure a minimum level of coverage for all taxpayers. This strategy results in somewhat lower direct effects and higher no change rate (compared to Strategy 2) but a higher overall reduction in misreported tax. The larger reduction in misreported tax for Strategy 3 is due to a larger indirect effect since this strategy affects a broader segment of the taxpayer population. Figure 6 displays the time series of the average tax Net Misreporting Percentage (NMP) -- defined as the net amount misreported in the taxpayer's favor divided by the sum of the absolute values of the amounts that should have been reported -- of these five simulation runs for the four audit selection strategies. Based on visual inspection, the model reaches a stochastically stable solution for all strategies after about 250 time steps. Using the simulation output for the last 50 time steps, the random audit selection strategy has the highest tax NMP at 15.1 percent. Strategy 1 is the next highest with a tax NMP of 15.0 percent. The NMP for the Strategy 2 is 14.5 percent. Strategy 3 has the lowest average tax NMP (highest voluntary compliance) at 14.3 percent. The development of the IRCM demonstrates that agent-based simulation is able to model the complexities of real-world tax systems, such as differences in reporting compliance at the line item level and taxpayers' heterogeneous response behaviors, which researchers have found difficult to incorporate in analytical models of taxpayer reporting behavior (Alm 1999). The value of having a model like the IRCM grows as our knowledge of taxpayer behavior improves. Therefore, an important component to future development and use of ABMs for tax administration is an ongoing program of research to further identify and restrict, as appropriate, the behavioral parameters used in such models. Such a research program must necessarily employ a range of data collection methodologies as appropriate including laboratory experiments, field studies, and surveys. The IRCM has undergone independent verification and validation testing by analysts at The MITRE Corporation. The model has been ported successfully to both Windows and Mac-OS platforms running Repast 2.0 and MASON. In addition, researchers from the MITRE Corp., in collaboration with the authors, are porting the IRCM to a multi-processor computing environment using Repast HPC to build a national-scale ABM (~108 U.S. taxpayers). Cline et al. (2014) describes the initial stage of this research to port the IRCM from Repast to Repast HPC. Kim Bloomquist is especially grateful to Professors Robert L. Axtell and Claudio Cioffi-Revilla for their guidance and encouragement on this project, which was done in partial fulfillment of his PhD in Computational Social Science at George Mason University, Fairfax, Virginia. The views expressed herein do not necessarily reflect those of the Internal Revenue Service. 1Having to perform a simulation for 250 time steps to achieve a stochastically stable solution is an artifact of the optimization routine which reallocates a single audit from the least to the most productive audit strategy at each time step. Without this optimization feature selected (i.e. using the default option of random audit selection) a stochastically stable solution is achieved in 10 to 15 time steps. This can be seen in Figure 6 for the Random Audit Selection Strategy. ALM, J., Martinez-Vazquez, J., & Torgler, B. (2010). Developing Alternative Frameworks for Explaining Tax Compliance. Routledge, New York. ANDREI, A.L., Comer, K., & Koehler, M. (2014). An Agent-Based Model of Network Effects on Tax Compliance and Evasion. Journal of Economic Psychology 40 (C): 119-133. ALM, J. (1999). Tax Compliance and Administration. In: Hildreth, W.B. and Richardson, J.A. (eds. ), Handbook on Taxation. Mercel Dekker, New York. ANTUÑES, L., Balsa, J., Respicio, A., & Coelho, H. (2007). Tactical Exploration of Tax Compliance Decisions in Multi-Agent Based Simulation. In: Antuñes, L, and Takadama, K. (eds. ), Multi-Agent Based Simulation VII. Springer-Verlag, Berlin. AXTELL, R.L. (2000). Why Agents? On the Varied Motivations For Agent Computing in the Social Sciences. Center on Social and Economic Dynamics Working Paper No. 27. Brookings Institution, Washington, D.C.
AXTELL, R.L. & Epstein, J. M. (1994). Agent-Based Modeling: Understanding Our Creations. Bulletin of the Santa Fe Institute: 28–32. BLOOMQUIST, K.M. (2004). 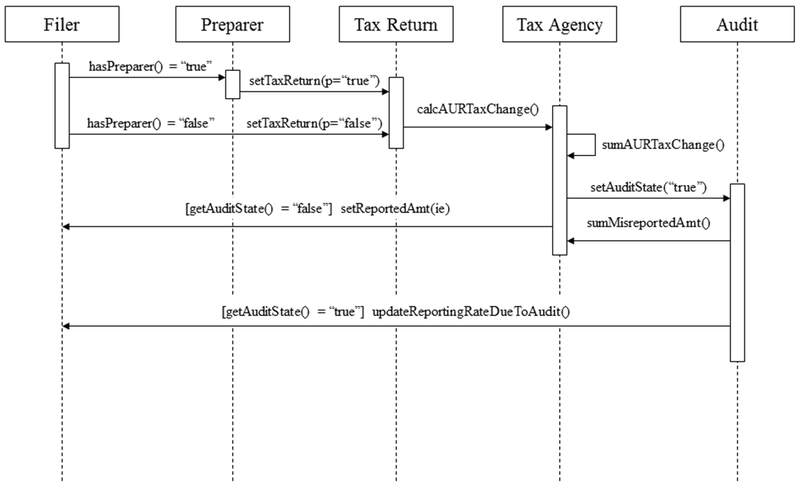 Multi-Agent Based Simulation of the Deterrent Effects of Taxpayer Audits. National Tax Association Proceedings: 159–173. BLOOMQUIST, K.M. (2012). 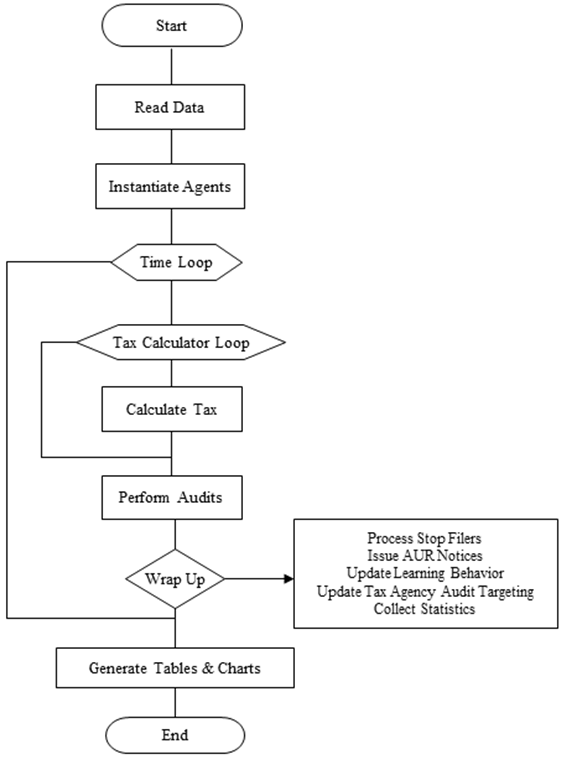 Agent-Based Simulation of Tax Reporting Compliance. Doctoral dissertation in Computational Social Science, George Mason University, Fairfax, Virginia. http://digilib.gmu.edu/dspace/bitstream/1920/7927/1/Bloomquist_dissertation_2012.pdf. CLINE, J, Bloomquist, K.M., Gentile, J.E., Koehler, M., & Marques, U. From Thought to Action: Creating Tax Compliance Models at National Scales. Paper presented at the 11th International Conference on Tax Administration, Sydney, Australia, April 14–15, 2014. GHALLAB, M., Nau, D., & Traverso, P. (2004). Automated Planning: Theory and Practice. Morgan Kaufmann Publishers Inc., San Francisco, California. JANSSEN, M.A. & Ostrom, E. (2006). Empirically Based, Agent-Based Models. Ecology and Society 11, 37. http://www.ecologyandsociety.org/vol11/iss2/art37/. MITTONE, L. & Patelli, P. (2000). Imitative Behaviour in Tax Evasion. In: Stefansson, B. and Luna, F. (eds. ), Economic Modelling with Swarm. Kluwer, Amsterdam. NORTH, M.J., Tatara, E., Collier, N.T., & Ozik, J. (2007) Visual Agent-based Model Development with Repast Simphony. Proceedings of the 2007 Conference on Complex Interaction and Social Emergence, Argonne National Laboratory, Argonne, IL USA. https://cc.ist.psu.edu/BRIMS2013/archives/2008/Tutorials/08-BRIMS-001.pdf. Archived at http://www.webcitation.org/6LIwtrn5z. SZABÓ, A. Gulyÿs, L., & Tóth, I.J. (2008). TAXSIM Agent Based Tax Evasion Simulator. Paper presented at the European Social Simulation Association Conference (ESSA). WEBER, M. (2004). General Description Booklet for the 2001 Public Use Tax File. Individual Statistics Branch, Statistics of Income Division, Internal Revenue Service.